Traveling is about exploring, stepping out of one's comfort zone, and jumping feet first into local customs and traditions. And like many travelers I find that engaging with a community's food and drink culture provides an important means of better understanding that place and provides a convivial atmosphere for engaging with locals. For me that often means exploring the beer and wine culture of my traveling destination, even in areas not known for the production of either. Most people don't equate Hawai'i with craft beer, instead most think beaches, coconut palms, and fruity drinks with umbrellas. But the state has a long history of brewing, and craft beer has been in recent years, despite the expense of sourcing ingredients, making inroads into the local bar and resort scene. Hawai'i's first commercial brewery, The Honolulu Brewery, was established in 1854 by Bischoff and Company, who maintained the brewery until 1857. After the closure of the Honolulu Brewery, beer in the islands was difficult to come by and provide largely through importation. In 1865, Thomas Warren and Willard Francis partnered and opened Hawaiian Beer, offering residents of the the big island "lager beer in casks, kegs and bottles." (1) The partnership eroded 4 months later and the two became competitors; Thomas Warren opened Oahu Brewing, and Willard Francis remained at the helm of Hawaiian Beer. Both brewing companies failed. Francis, a few months after Warren established his brewery, placed his brewery for sale and left Hawai'i. Warren, because of the difficulty in finding a skilled brewer, converted his operation into a distillery. Others attempted to make and sell beer in the islands but couldn't capture a market or public attention. The most successful of these failed enterprises was National Brewery, opened in 1888, selling "Steam Beer," (like the vaunted Anchor Steam in San Francisco, whose operations date back to the 1850s) in kegs and bottles to saloons and local consumers. National's Steam Beer remained popular with island dwellers and sold fairly well for several years, eventually closing in the 1890s. The failure of Hawai'i's upstart brewing industry came, most likely, at the hands of its missionary population. Missionaries for the Presbyterian, Congregationalist, Baptist, and the Mormon churches all found their way to the islands, attempting to convert the local population and, in the process, forbade their charges from drinking. As missionary work gave way to plantations, the religious in Hawai'i and the plantation owners who understood their profits would fall if their converted workers were drunk or hungover continued their fight against alcohol through anti-saloon leagues, and pro-prohibition organizations like the Women's Christian Temperance Union. These groups led an all out war against alcohol on the island, attacking anyone or any company that attempted the production and/or sale of alcohol. Despite the pressure from religious zealots, anti-saloon leagues and prohibitionists, brewers struggled on. In 1901, Hawai'i's longest lasting brand, Primo, came to market for the first time. Produced by the Honolulu Brewing and Malting Co. Primo found a market both with plantation workers and with a growing tourist market. Primo remained a popular and iconic beer until Hawai'i's legislature gave in to prohibitionist pressure and outlawed alcohol on the islands in 1918. In 1933 with the national repeal of prohibition, thirsty Hawai'ians jumped headlong into brewing once again. Primo resurfaced, this time produced by the Hawaii Brewing Corporation, which would maintain control over the brand until 1963 when like many regional brewers it would fall victim to consolidation by big beer (Schiltz maintained control of Primo until it was bought out by Strohs in the 1980s). Competing with Primo were American Brewing Company's Pale Ambrew (first produced in 1934), and Royal Beer (1937), these three beers would define Hawaiian beer, becoming the favorite brands of American GIs stationed in Hawai'i , as well as tourists and locals. By the 1960s and 70s consolidation in the brewing industry would see the destruction of locally brewed beer in Hawai'i. Shlitz would move Primo's production to its brewery in Los Angeles, putting an end to Hawai'i's longest locally produced label. Royal would be forced out of business by economic pressure put on it by the importation lower costing brands like Budweiser, Miller and the other big industrial brewers. By the end of the 70s beer making in Hawaii had ceased. In the first wave of the craft beer movement several microbreweries and brew pubs tried to cash in on the nascent artisanal movement and tourist dollars available on the islands, but most failed to gain market share against the big three. The first to try was Pacific Brewing Company, who brewed Maui Lager from 1986 until they closed in 1990. Others came and went in the same period, but the more mainstream popularity of craft beer in the 2000s has seen a resurgence of craft brewing on the island. Today, there are about 10 breweries and brewpubs on the islands and during my last visit I tried to taste from as many as I could, which turned out to be four. 1. Kona Brewing, because of its association with the Craft Brew Alliance (joined in 2010) has the widest distribution and is the easiest of Hawai'i's craft beers to find on the islands. Kona started in 1994 on the big island of Hawai'i and has grown tremendously, producing more than 220,000 barrels a year. While I didn't get a chance to visit one of their pubs or the tasting room, I did sample several bottles and draft beers from their lineup. Remember context is everything and most of these beers were consumed either on a beach looking at a gorgeous view after hiking through tropical forests, or while enjoying the sunset on our lanai or at a beach-front bar making them all pretty damn delicious. Long Board Lager (bottle and draft): a beer perfect for the beach. Light refreshing and smooth with a nice malty backbone and light, spicy hop finish. Not your father's Budweiser, this is a lager with a bit of backbone. 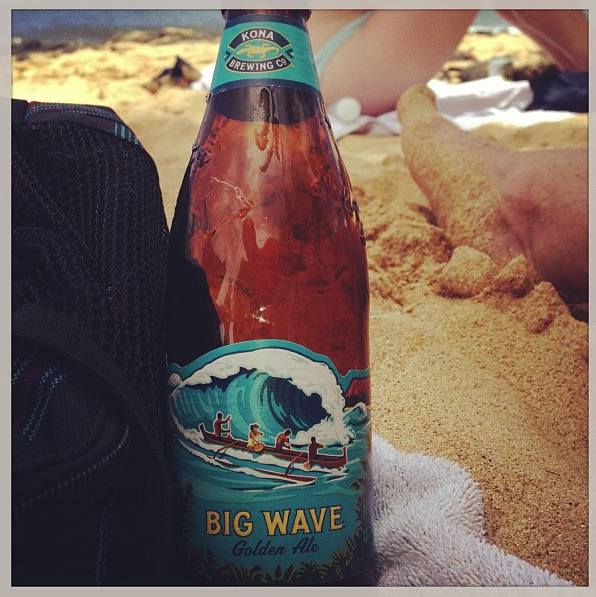 Big Wave Golden Ale (bottle): 2013 Gold Medal, Session Ale, U.S. Open Beer Championships, and I have to agree. This is a very drinkable but interesting low alcohol beer. Perfect for long days on the beach or as a post activity refresher. Light bodied, but malty enough to be interesting, with a unique hop characteristic (Galaxy and Citra) that comes off slightly tropical on the finish. Fire Rock Pale Ale (bottle) : Well-balanced pale ale that would be comfortable in any Pacific Northwest pub (though their marketing material call it a Hawaiian Pale Ale). Light copper color, medium bodied, with a pleasant citrus hop finish (Millennium and Cascades). Worked really well with food. Wialua Ale (draft): Kona's summer seasonal. Another light-bodied golden ale like their Big Wave, only this one is brewed with passion fruit and bit of malted wheat giving the beer a tropical punch flavor up front with a nice spicy bitter hop (Millennium) finish. I'm not a huge fan of fruit/wheat beers but this one was good in the context in which it was drank. 2. 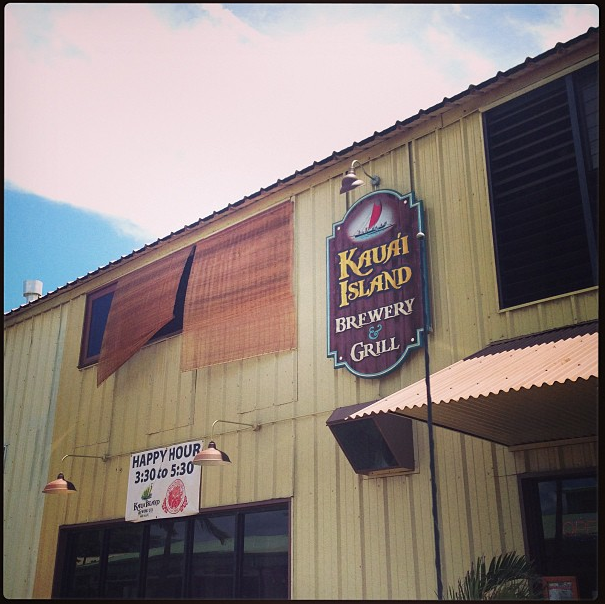 Kauai Island Brewing Company is a small brewpub and brewery in the town of Port Allen (western most brew pub in the U.S.). Started in July 2012, the brewery and pub offers food (which was pretty fair pub grub) and at least 10 taps pouring both their beers and guest microbrews (Ballast Point was on tap last week). The owners are from the now defunct Waimea Brewing Company, but they brought their most popular beers from Waimea and are still brewing them along with several new beers. I tasted through the bulk of their lineup, and for an upstart brewery with limited resources and difficulties sourcing grain and hops the beers were surprisingly good. Cane Fire Red: To be honest I've never had a red I like. There is just something about this style that turns me off. I find them all too sweet and often flabby and boring. This one was no different. If you like reds though, you probably would like this one. Apparently it's their most popular beer and they have a difficult time keeping it on tap. I must be wrong. Kalo Brew: Their most interesting and locally unique beer. Kalo is brewed with 60 lbs. of taro root in the mash, giving the beer a unique sweetness and medium body that I found quite pleasant. 3. Most grocery stores also stocked a pretty decent supply of other Hawaiian made beers. Hawai'i Nui Brewing Company (who also own Mehana Brewing and Kieko Brewing current producers of Primo under license from Pabst), have fairly wide distribution and are easily found throughout the island. 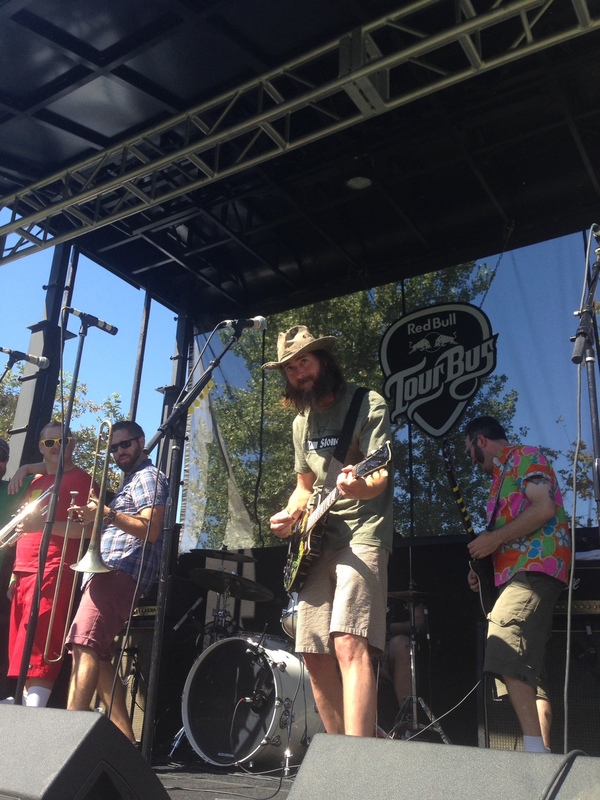 This brewing company founded in 2007 seems to be suffering from growing pains, expanding too fast, and acquiring too many labels, and has recently filed Chapter 11 reorganization papers. Perhaps that is what's also responsible for the lackluster quality of their beer. Hawai'i Nui's beers were my least favorite of the trip and rank particularly low on my overall scale of craft brewers. I know this is like kicking a dog when it's down, but I do hope they can come back from the bankruptcy, consolidate their labels (their now brewing more than 10 beers under two labels) and get their flavors back on track. To be fair I didn't taste any of their Mehana label only the flagship Hawai'i Nui beers (and only 3 of them), so my assessment of the overall quality of their beer is skewed. Kaua'i Golden Ale (draft): This is another of those light golden ales that are popular among Hawaiian breweries. It's a light, low-hopped beer with just nothing that interesting to recommend it. It might be a good gateway beer for the Bud, Miller, Coors crowd, but I found it bland and ultimately boring and forgettable. Sunset Amber (bottle): My least favorite beer of the trip, an overly sweet, medium-bodied beer that had a strange off flavor that I couldn't quite put my finger on. No hops, which might have saved this beer. Again boring. Hapa Brown Ale (draft): The best of the worst. Faint praise I know, but this beer wasn't all that bad and represents what they can do. A medium to full bodied brown, malty but well balanced with a good amount of hop bitterness to cut the sweetness. I can recommend this beer if you run into it. CoCoNut PorTeR (draft): a sweet medium-bodied porter with quite a bit of coconut on the front of the palate, that to me comes of cloyingly sweet, but that many people including those I was drinking with found quite pleasant. It finishes with a bitterness from the black malts that is redolent of chocolate and coffee. The hops providing just a hint of bitterness. Big Swell IPA (draft): a smooth malty well-balanced IPA that starts off with an impressive aroma of Northwest hops and a malty sweetness that gives way to a great hoppy bitterness. Delicious and one of my favorite beers of the trip. 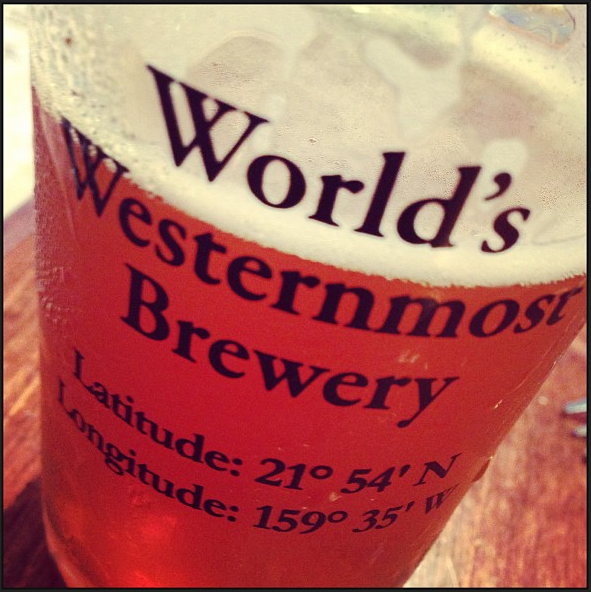 Drinking my way across Kauai might not have brought me closer to any of the locals, but I do feel much closer to the brewing history on the Islands. 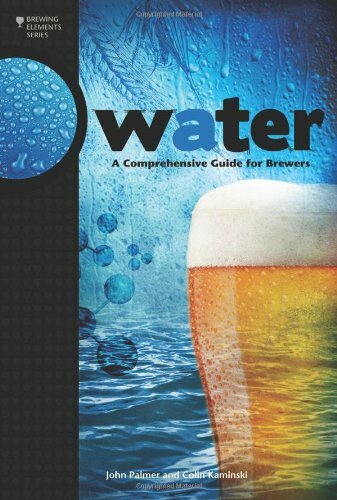 1) For more on the history of brewing in Hawai'i see Robert Schmidt, "Hawai'i's Beers and Brewers," The Hawaiian Journal of History, vol. 31 (1997) 143 - 150.